Seven days of Alaskan wild. 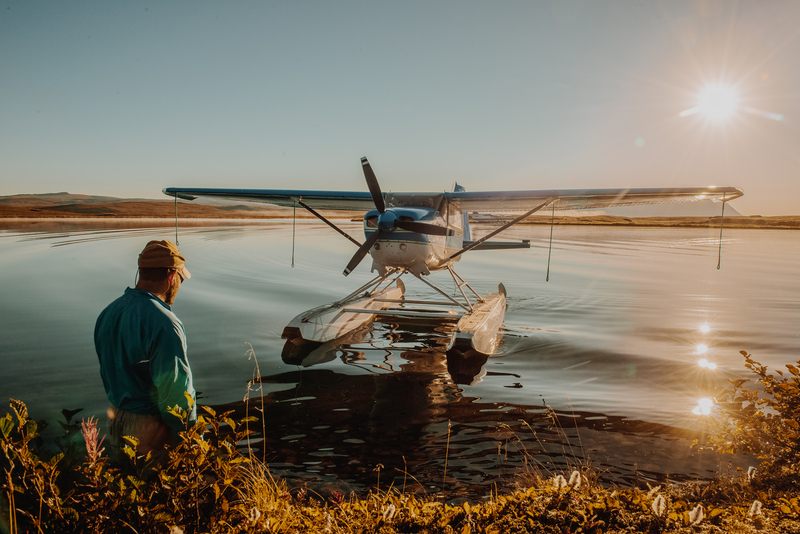 Float planes, backcountry campsites, snowcapped peaks, glacial lakes, and the rare opportunity to watch grizzly bears safely in the wild. This trip is incredibly special. You could watch for hours and still be awe-struck by the vastness of the landscape. 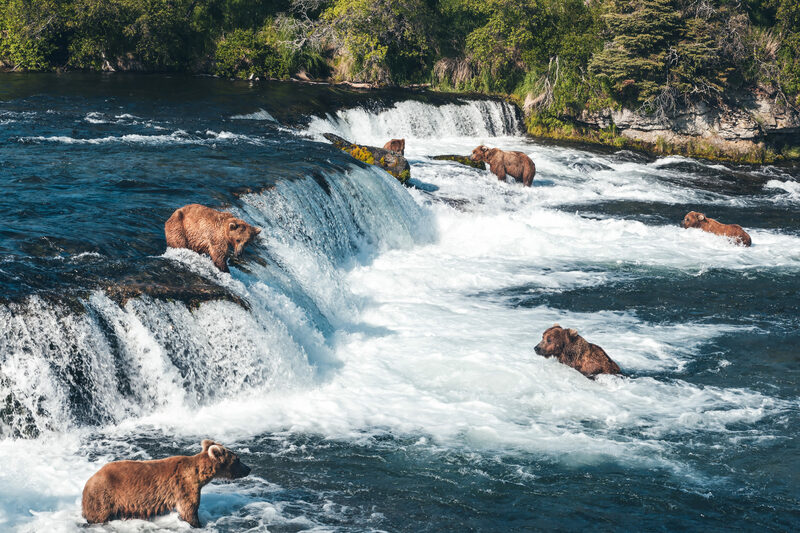 You’re deep into Alaska’s Katmai National Park – the most remote corner of a remote expanse famed for its 2,200 wild brown (grizzly) bears feasting in rivers that run wild with sockeye salmon. 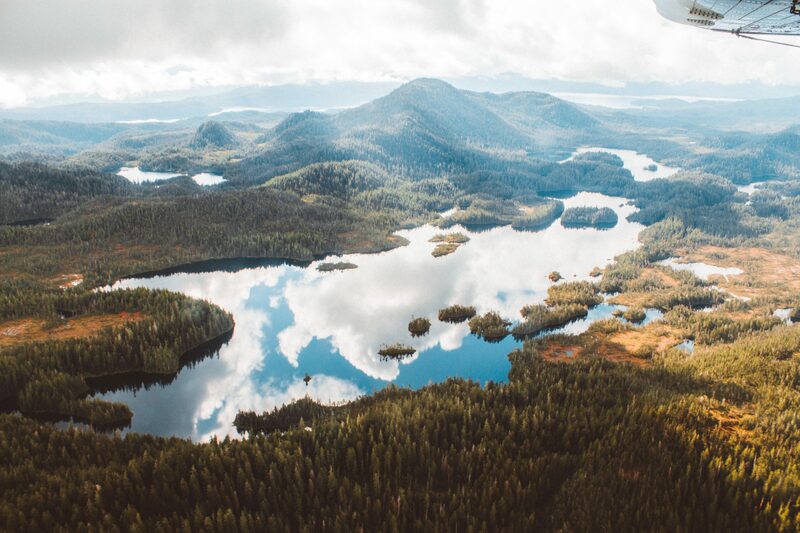 You journeyed here by float plane to hike from pristine lakes in volcano territory, over tundra squeezed by snowcapped peaks, to campsites on beaches of glacial lakes. As you stare off into mirrored lakes at the scenery beyond, it hits you: No public group has done this before. This time, you are the trailblazer. This epic seven-day adventure reaches rarely seen corners of some of Alaska’s wildest national parks. This is an entirely new route created – no exaggeration – just for us by a guide who’s lived here 25 years and has always wanted to do this. We have prime access to Katmai and Lake Clark national parks with seasoned guides, expedition-worthy camping gear, great backcountry cooking, and the final reward of lakeside cabins you won’t want to leave. 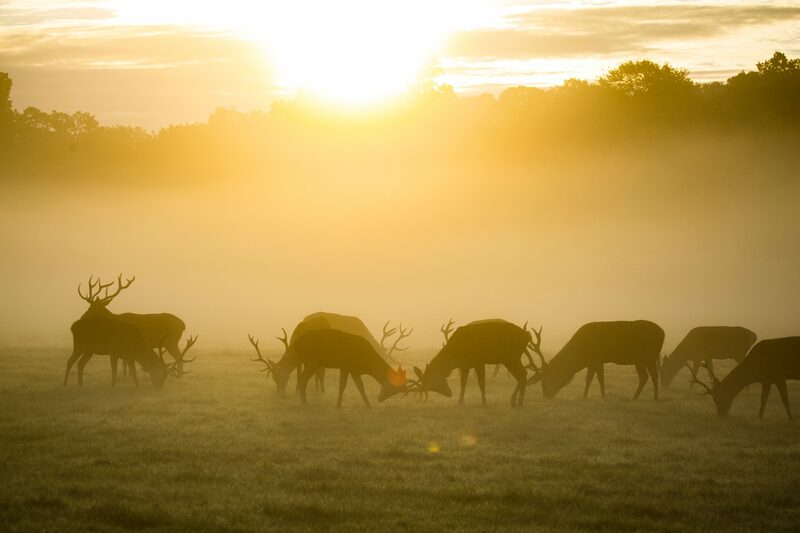 If you want to immerse yourself in wilderness and wildlife, this trip is for you. 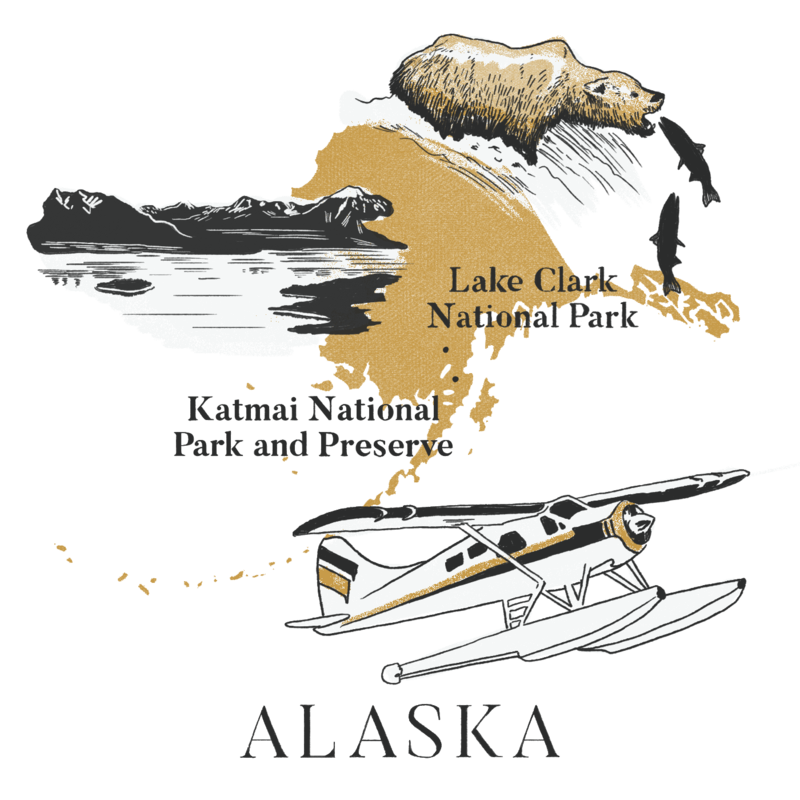 We'll be deep in remote and rarely visited parts of Alaska, accessed only by float plane. 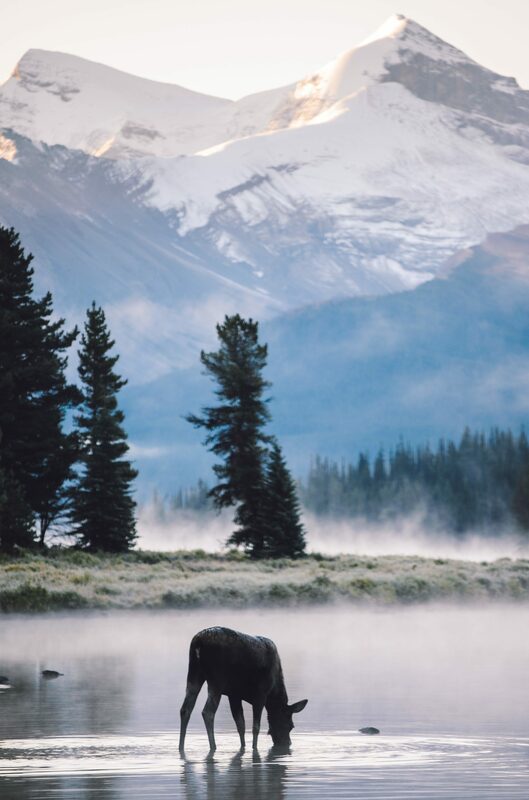 We’ll hike through untouched wilderness, camping along clear streams, and keeping our eyes peeled for majestic wildlife (including grizzly bears!). We'll cover about 6 miles a day, with up to 2,000 feet of elevation gain/loss. Our hikes take us off-trail through steep and uneven terrain. This moderate trek is accessible for most age levels who maintain good physical fitness and are prepared for the demands of backcountry hiking. This trek is led by expert local guides with deep experience in Alaska's backcountry. Most gear is provided for us. We'll sleep in 2- or 4-person tents and help set up camp each day. We’ll carry backpacks (30-40lbs) with our individual gear and a portion of the group gear. Our guides prepare all meals. Backcountry Alaska gets real wild, in the remotest corners of Katmai and Lake Clark national parks. Float planes, glacial beach campsites, salmon-packed rivers and plenty of wild grizzly bears. Let's go deep into the backcountry. The adventure begins! 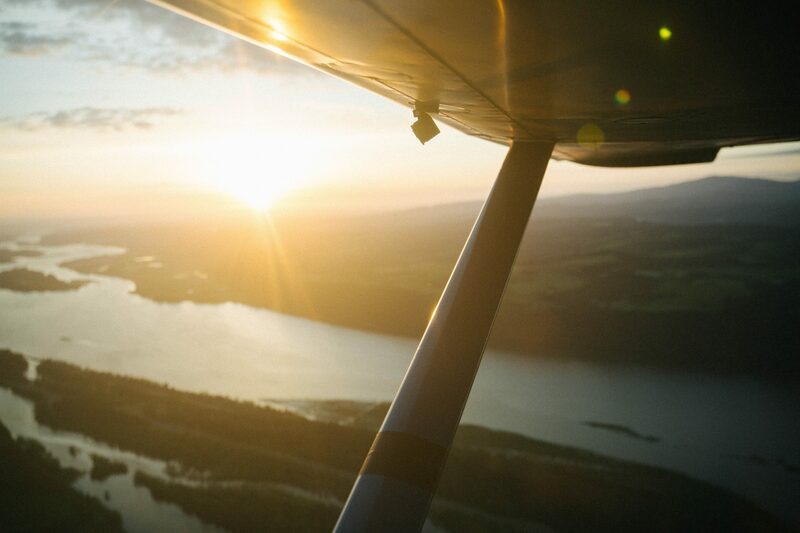 We meet in Anchorage, check our gear, then head out on a gorgeous plane ride down the wild coast of the peninsula. After a stop for lunch on Lake Clark’s shores, we fly again, this time over moraine, snaking freshwater rivers, sprawling snow-capped mountains and glacial lakes into the remote north corner of the remote Katmai National Park to begin our exploits in the serious Alaskan wild — over 4 million acres of spruce forests, rushing rivers and wild mountains. We’ll set up camp on the reddish banks of Iron Springs Lake, a large acidic lake with high aluminum content reminding you we are in volcano country. We’ll have a short day hike to get acquainted with our new backcountry home, then have dinner and rest up for the beginning of our first leg: a three-day trek to Mirror Lake. Getting to our remote Katmai destination takes three days of pristine backcountry hiking (don’t worry, it’s not grueling enough to divert attention from the wildlife and beauty). From our camp at Iron Springs Lake, we eat up then head out onto the tundra, watching for herds of caribou, eagles soaring, and the park’s many grizzly bears. This night we’ll set up camp on a lake and relax by a roaring campfire. The next morning, we rise early for a hot breakfast, then hike past small spring-fed lakes and creeks to the Moraine Creek headwaters. Our campsite is near some of Alaska’s most vigorous salmon waters. On our final day’s walk to Mirror Lake, our route rises in broad tundra surrounded by spectacular peaks, which we admire while snacking on dried fruit and energy bars we pack along. The reward is just ahead, where we camp, beachside on the aptly named Mirror Lake. We’ll be happy to have two nights here. We have a full day at this surreal spot on Mirror Lake – many miles and a world away from any other people. 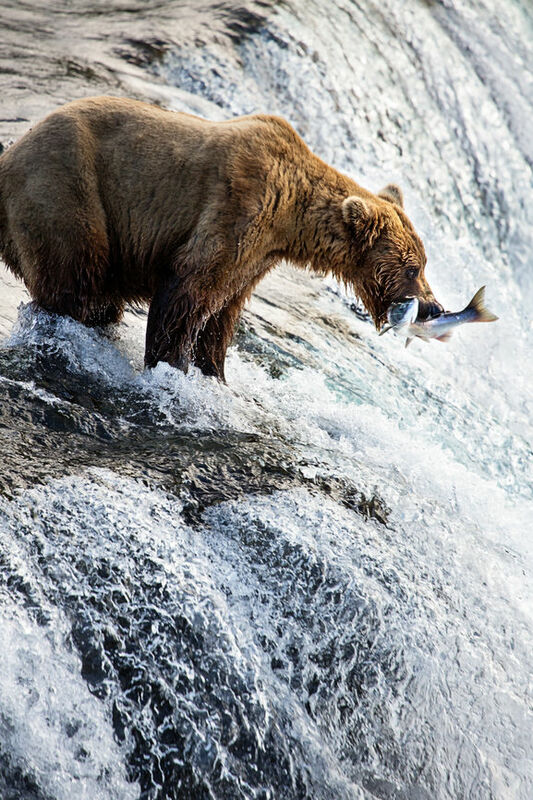 We’ll take daypacks to ramble along Funnel Creek, a prime spot for watching a dozen or so of the park’s more than 2,200 wild grizzly bears catching sockeye salmon as they leap up the the roaring waters. We’ll have a safe viewing area, on the ridge between mountain tops and the creek below. 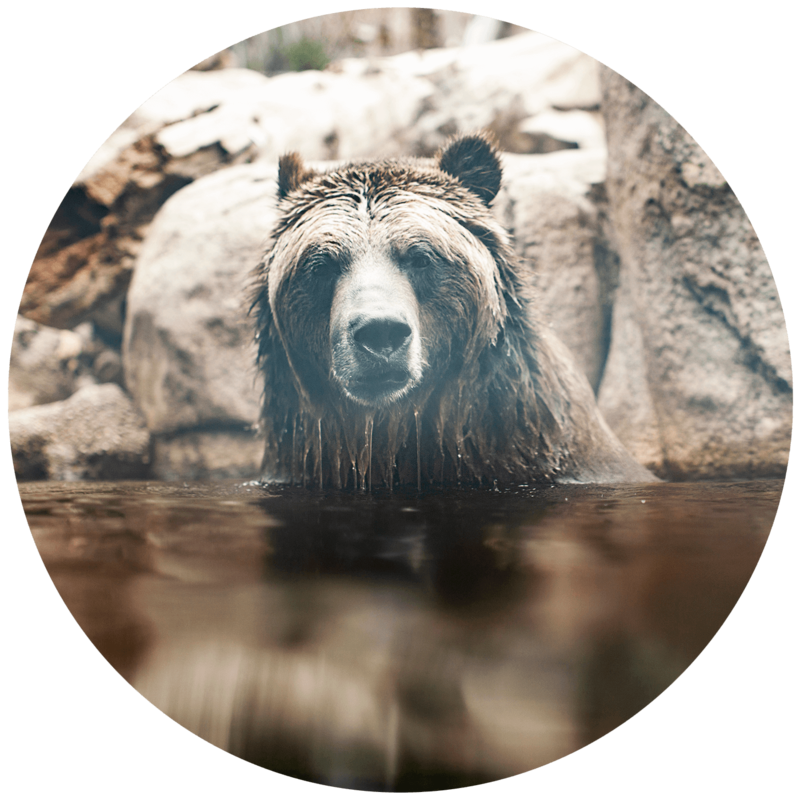 Not many people have an opportunity to safely watch grizzly bears in the wild – you’ll talk about this moment for years to come. 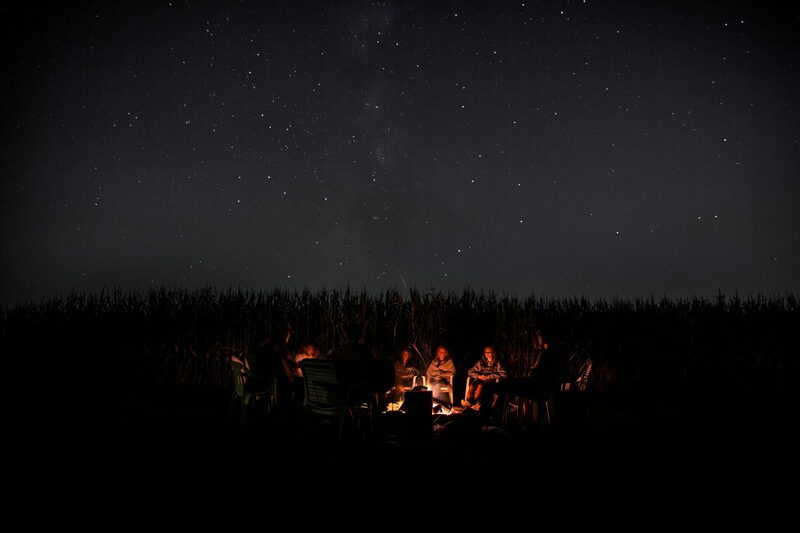 That night we’ll dine lakeside and take in the twinkling stars in a place very, very few people have ever seen. This is truly special. Katmai isn’t the only patch of remote glory on the peninsula. Today we’ll rise for breakfast, then hear something surprising: our float plane, descending to Mirror Lake. Our private float plane will whisk us to Farm Lodge’s lakeside cabins at Port Alsworth, on the namesake lake of Lake Clark National Park. Bigger than Connecticut (and a national park only since 1980), Lake Clark sees just a few thousand visitors a year, often coming to paddle in the paradise of the lake. First, let’s be honest, we’ll hit the showers then have time to look for more wildlife, hike or paddle on the lake before gathering for a celebratory dinner to tally our bear tales over a table-full of home-cooked Alaskan fare. Alas, our time in this patch of paradise is over. We pack up for our flight back to Anchorage, bid a fond farewell to our new group of friends, bonded over Alaska’s great wild, with backcountry memories to share for years to come. Until next time! Backcountry camping spots on mountain-rimmed tundra and lakeside beaches, plus a grand finale of cabins at an all-timer location. For Days 1 thru 5, we'll camp in the backcountry. 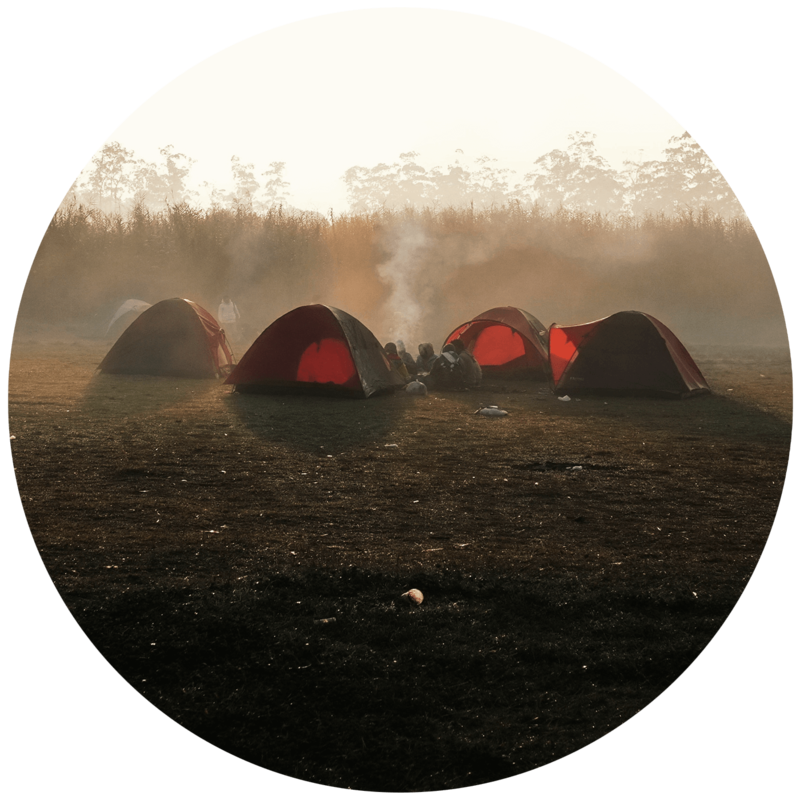 We provide expedition-quality tents and trekking poles, along with group-size tarp shelters and all the gear we need to camp safe and comfortable—plus an array of portable cookery for camp-kitchen feasts of seriously delicious cuisine (from reindeer rotini to Shanghai noodles). 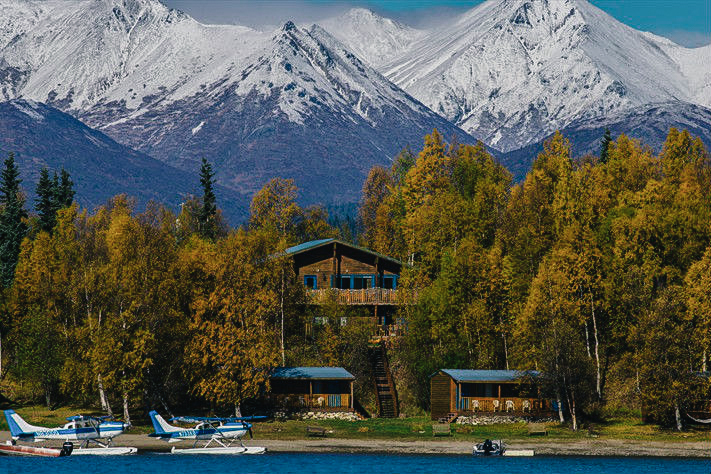 We spend Day 6 at the remote, incredibly scenic Farm Lodge, located in Port Alsworth at the headwaters of Lake Clark. The Farm Lodge is a worthy reward after several days of trekking. 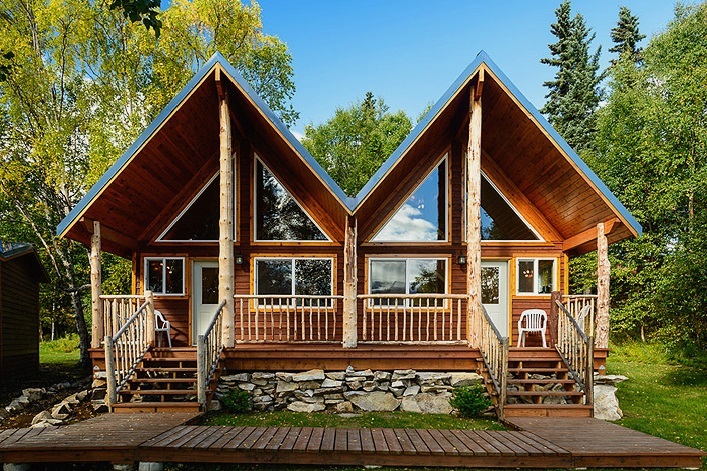 Cabins face the water, neatly reflecting snowcapped peaks that rim the lake. We’ll have options to hike, raft or look for wildlife here, plus seriously fresh home-cooking for our final feast. That’s OK, we have answers. Read our FAQs below or call +1 (503) 676-6795 to ask us any questions you have about traveling with Backpacker. We're here 8am-5pm weekdays, 9am-1pm Saturday Pacific. Accommodations for 6 nights; internal bush flights and float plane flights; ground transportation as a group; all meals and beverages; group supplies – group sized tarp shelters, cooking equipment and utensils, toilet supplies, satellite phones, maps; GPS; medical kit, rescue equipment; trekking poles; entrance fees for national parks; and gratuities for expedition guides. We will be joined for this adventure by up to 2 expert expedition guides. Each guide is medically certified as a Wilderness First Responder and is highly qualified in all necessary skills to safely travel throughout Alaska’s vast wilderness. A Modern Adventure Trip Leader will also join the group as an experienced travel guide, a representative of Modern Adventure and the person to go to with questions or concerns on the trip. This is considered a moderately difficult backcountry backpacking adventure. You will be backpacking and hiking off-trail over steep, hilly, and uneven terrain, often covering more than 6 miles in a day with up to 2,000 feet of elevation gain/loss. Our longest day will be hiking 12 miles with a daypack. You may encounter short stretches of thick vegetation and may also experience Alaska's diverse selection of insect species. 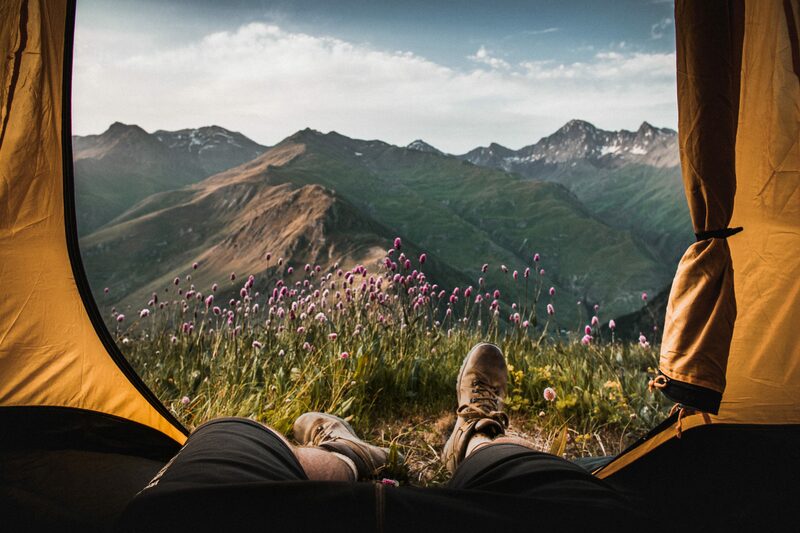 You will be camping in a very remote wilderness, sleeping in tents, relieving yourself in places with a stunning view, and sometimes enjoying all of the above in the rain. Our support staff will be with us for the entirety of the adventure helping us carry group supplies and helping us see the true Alaskan experience. 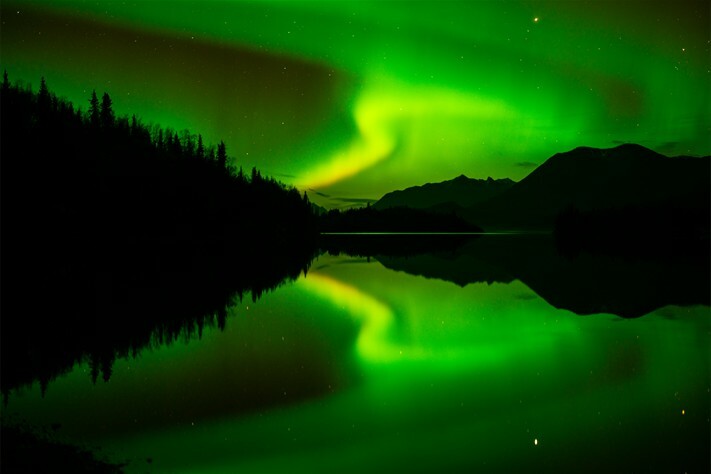 We recommend you arrive at the Anchorage Airport (ANC) in Anchorage, Alaska, on or before August 31, 2019. We’ll meet as a group at 8am on September 1, 2019, in the lobby of a central Anchorage hotel. Our last day of this adventure is September 7, 2019. You should schedule flights home after 9pm on September 7 from the ANC airport. For the five nights we camp in the wilderness, Modern Adventure provides expedition-quality tents, as well as group-sized tarp shelters for enjoying meals in. Not only does including the finest equipment make camp life more comfortable, it also adds a level of safety to trips ensuring that we have all the gear we need to stay safe and comfortable. Our last night on this trip is at Farm Lodge, a beautiful remote lodge in Port Alsworth, on the shore of Lake Clark. This adventure is recommended for travelers aged 18 and above who are in excellent health and have previous experience with backpacking. You will be expected to load and unload your own gear, carry a portion of the group gear, and manage your own physical comfort and well-being. Pre-trip physical conditioning should begin no later than 2 months before departure and should include walking or hiking, preferably with loaded backpack of 30-40 lbs. This adventure will be limited to no more than 10 fellow adventurers and your Modern Adventure team. US citizens and residents should check the TSA’s website for requirements and acceptable ID for domestic air travel. Some State issued IDs may no longer meet TSA standards. If you are a Non-US Citizen traveling to Alaska, visit the US Consulate or Embassy for requirements and information about passports and visas. Roundtrip airfare to/from Alaska; travel insurance; transportation to the trip’s meeting point; activities not included in the trip itinerary; lodge incidentals; personal gear – sleeping bags and mats, backpacking packs, camping chair, personal items & clothing; gratuity for tour leader. You may cancel on or before May 28, 2019 and receive a full refund minus a $500 per-person service fee. If you cancel between May 29 and July 2, 2019 there is a 50% cancellation fee. On or after July 3, 2019 there is a 100% cancellation fee. We highly recommend purchasing travel insurance as we are not able to make exceptions to this policy in cases family/medical emergency or cases of the trip being cancelled (See our Terms and Conditions for full details).